U.S. Rep. Suzanne Bonamici participated in a panel discussion and answered community questions Tuesday evening. 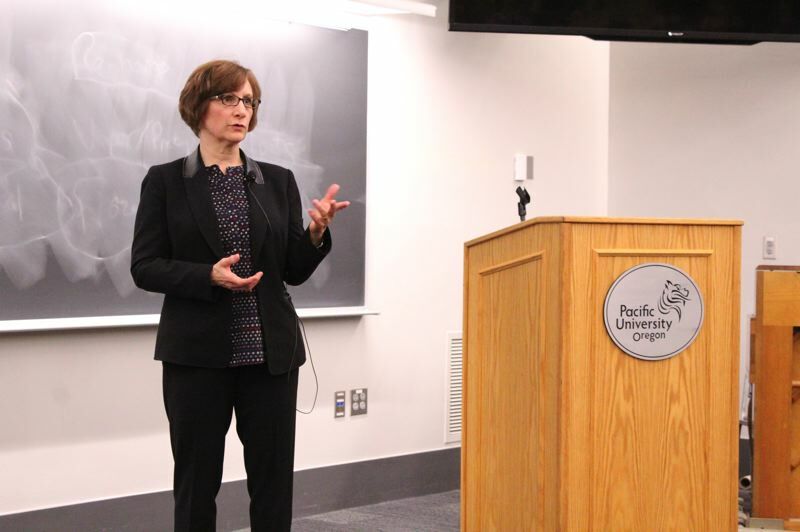 U.S. Rep. Suzanne Bonamici made a visit to Pacific University Tuesday night, Oct. 17, to talk with students, staff and community members — but it wasn't a traditional meeting for a candidate running for re-election. Bonamici, who has represented northwestern Oregon in the U.S. House of Representatives since 2012, wasn't there to discuss her political views or agenda, but instead to have a conversation about the role that gender plays in politics. "It's a really important conversation that we are having this evening," Bonamici said. "The role of women in government and politics is a topic that's getting a lot of attention not just here in Oregon, but, of course, nationally." The event — which was open to the public — was organized by Pacific University's Center for Gender Equity, Pacific's McCall Center for Civic Engagement, and the Hillsboro/Forest Grove branch of the American Association of University Women. Bonamici shared what led her to politics, the obstacles she faced along the way as a woman, and some she still faces today. Attendees also got the opportunity to discuss current political concerns with the congresswoman and ask for her advice on entering the political arena, or how to encourage others to do so. Bonamici first acknowledged the growing number of women getting involved in government and politics, specifically since the 2016 presidential election, and said this phenomenon is "really something to be excited about." "In the U.S. Senate, there are 23 women, which is an all-time high, but that's still less than 20 percent," Bonamici said. "It really matters. Representation matters. It matters who is sitting around the table, it matters what issues get focused on and what's on the agenda, and women tend to focus on a broader range of issues." She suggested the difference in leadership style between most men and women, and that often women are criticized for not seeming like leaders. "Women tend to be more collaborative and I've found that women are less focused on getting credit and more focused on getting stuff done," Bonamici said. "I'd rather get something done than get the credit for it." While Bonamici said she believes there is a difference in how men and women are perceived in office, she acknowledged that she hasn't experienced much negative impact during her own stint in the political world. "I don't really think that people have not listened to me because I am a woman," she said. "I feel like I've been included in conversations. I haven't lost opportunities because of it, but I don't know that everyone would feel the same way, especially in other offices." Asked how she would encourage other women to get more involved in politics, and how to approach some of the potential barriers faced based on gender, Bonamici suggested finding an issue you are passionate about and getting involved on the local level. For her, it was education, which eventually led her to serve on the Oregon State Legislature, now a leader of the Committee on Education and the Workforce. She also had a big role in passing the Every Student Succeeds Act, formerly No Child Left Behind. "I always say, 'I don't want anybody to vote for me, or any woman, just because she is a woman,'" she said. "The women who are running (across the country) are incredibly qualified — they are not just saying 'Vote for me because I am a woman.'" Bonamici has been in the minority caucus for her entire tenure in the House. She was asked how she finds the motivation to continue to stay involved every day. She said while there is much division in the country, there are more bipartisan efforts by political leaders than people may think. "You build those relationships," Bonamici said. "I mean, people basically want the same thing regardless of where they are on the political spectrum. The ultimate thing that they want, their goal, is the same. They want to continue to be safe, they want good jobs, they want a strong economy, they want good schools, they want clean air and clean water — they just have different ideas about how to accomplish those things, and (more) importantly, different ideas about the role of government in solving some of these issues." She added, "When the ultimate goal is the same, you find a place where you have common grounds." Bonamici continued to encourage those in attendance to stay involved, to follow the issues that interest them and to vote because it could lead them on their own path to political leadership. "It is a challenging time right now for our country in many ways. It's a challenging time in Congress. But I have an optimistic approach to life — it would be hard to do this job if I didn't," Bonamici said, "and I anticipate that more women will continue to run, more women will continue to be elected, and we will be better off for it."